I came across this picture (click to view larger) whilst on my net travels. 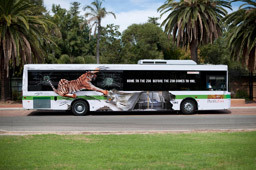 It is an Ad for Perth Zoo I believe and what an Ad it is! These kind of images that make use of the space it is in is quite remarkable. Very clever indeed, it’s like the Crunchy Nut ads that I have seen on Buses and Billboards (see below and click to view larger). Very clever use of the wheels and the idea that a man is so mad for Crunchy Nut he must jump out of his own vehicle to grab a bowl of it. It’s also very interesting that the same media can be used for two different brands in two very different geographical locations (Australia and United Kingdom). They maybe two different countries but marketing to their target audiences are the same and that people commute a lot in these places.